While watching a baseball game this weekend, I heard one of the announcers say: “Boy he really nailed that pitch.” His play by play analysis of the game reminds me that English can be a curious language. •	You can buy a box of 16 penny nails. 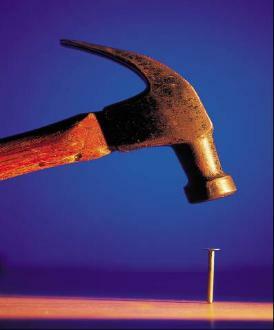 •	You can use a hammer to hit a nail, but you never want to hit a fingernail or drop the box of nails on your toenail. If you have ever watched a carpenter build a house, you know the importance of a nail. The framer will skillfully attach one 2X4 to another by hammering a nail through one and into the other. Without this framework, the house would soon crumble and fall to the ground. Jesus died for you when He was nailed to the cross as a sacrifice to pay for your sins. Because He had lived a sinless life, He fulfilled the requirements of the Old Testament Law, and the Law was nailed to the cross with Him. In the New Testament, the death of the Law is carefully interlaced with the power of grace—“For by grace you have been saved through faith, and that not of yourselves; it is the gift of God, not of works, lest anyone should boast (Ephesians 2:8-9). Every time you feel a sensation in a finger, hold your hand up, and see the message in the nails: It is Grace! Every time you see GRACE, remember the nail-pierced hand from which it flows.